Transform your dining space with these statement-making bar stools. 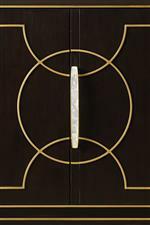 The repeating circle motif provides unique shapes and architecture to tie in with the rest of your sophisticated room decor. Espresso legs, satin gold kickplate, and burnished silver arm detail create a luxe complement to the linen white body fabric. The Carlyle Hemsley Upholstered Counter Stool with Burnished Silver Ring Detail by Lexington at Story & Lee Furniture in the Leoma, Lawrenceburg TN and Florence, Athens, Decatur, Huntsville AL area. Product availability may vary. Contact us for the most current availability on this product. The Carlyle collection is a great option if you are looking for Transitional furniture in the Leoma, Lawrenceburg TN and Florence, Athens, Decatur, Huntsville AL area. Browse other items in the Carlyle collection from Story & Lee Furniture in the Leoma, Lawrenceburg TN and Florence, Athens, Decatur, Huntsville AL area.